Team Guyana are Junior CASA Champs! See tournament website for details. Guyana made a clean sweep of the team titles when the 31st Junior Caribbean Squash Championships concluded at the Cascadia Courts in Trinidad on Sunday. 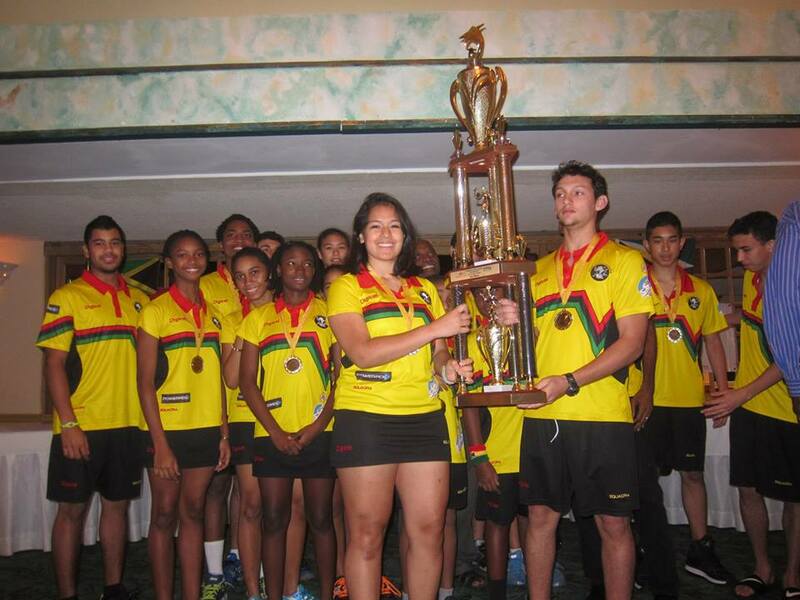 Guyana Girls’ team won its eighth consecutive team title and the country won its ninth consecutive overall team title. In the Girls’ team final, Rebecca Low went up against Alyssa Mullings, the Caribbean Under-15 champion. Low was no match for Mullings and went down in straight sets. In match two, Makeda Harding came up against Mira Handa. Harding had lost to Handa in the individual tournament three games to love, but on this occasion she was all fired up. Harding won the first game before Handa took the second, with Guyanese taking the third. However, Handa dug deep and won the fourth and fifth games. With Harding leading nine points to eight, the victory was still within her grasp, but Handa won the next three points and the match 3-2. Guyana Girls’ captain, Victoria Arjoon defeated Jessica Perkins 3-0. Gabby Fraser also defeated Michelle-Ann Denton 3-0. It eventually came down to the Under-17 Girls’ to decide who would win the title and Guyanese Akeila Wiltshire blew out Ashley Lynch 3-0. In the Boys’ team final, Ben Mekdeci, the best U-15 player at the tournament, comfortably disposed of Tahjia Lumley in straight sets. Guyana’s Shomari Wiltshire then beat Adam Ardito 3-1. Further, Jean Claude Jeffrey won a hard-fought game against Caribbean Under-19 champion Ashante Smith, beating him 3-2 to secure the title for Guyana. Guyanese Steven Xavier beat Julian Morrison 3-0 while his compatriot Nyron Joseph defeated Jake Mahfood 2-0. In an invited comment after the victory, president of the Guyana Squash Association (GSA), David Fernandes, said he was extremely proud of the players’ performance. “I’m extremely proud of the young players. Before every match we spoke of them giving 110 percent and they did just that. They never gave up, they did very well. It’s really an amazing and proud feeling,” Fernandes stated. Fernandes said the success of the team did not come as a surprise since the players had put in a lot of training prior to the championship. He lauded the youngsters for their discipline and work ethic, noting that the Guyanese are “unmatched in the Caribbean” when it comes to those areas of their game. While he heaped praises on all the players, Fernandes was particularly impressed with the performance of nine year-old Shomari Wiltshire, who placed third in the individual competition and won all his team matches. This entry was posted in 2013 Junior CASA in Trinidad, Trinidad & Tobago by admin. Bookmark the permalink. ← Previous Previous post: Barbados are 2012 Senior CASA Champs!